Nobody seemed to know where it was. 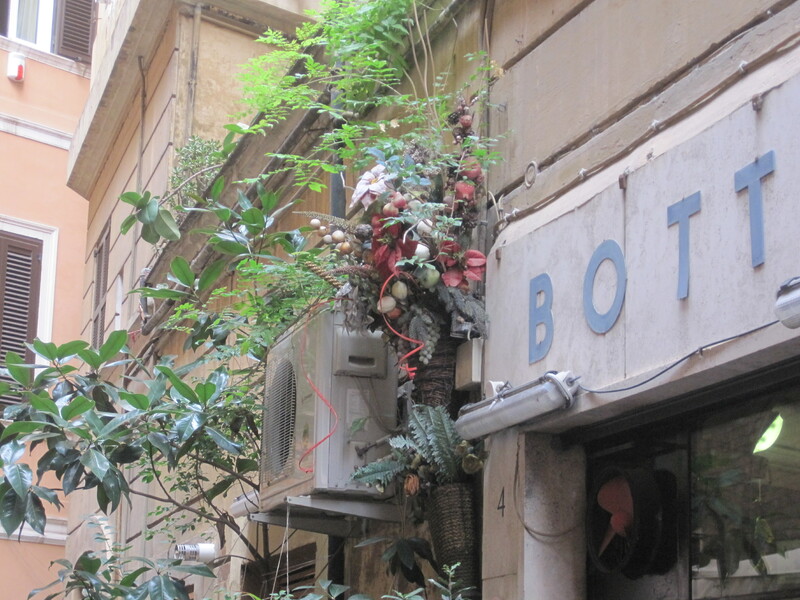 “È un ristorante famoso per Slow Food! It’s a restaurant famous for Slow Food” for cryin’ out loud! How could it possibly be so illusive? Wandering in circles around Piazza del Parlamento, Parliament Square in Rome, we were already 15 minutes late for our lunch prenotazione, reservation. If it weren’t for the fact that we had actually talked to them on the phone, we would have sworn the long-time favorite restaurant didn’t really exist. 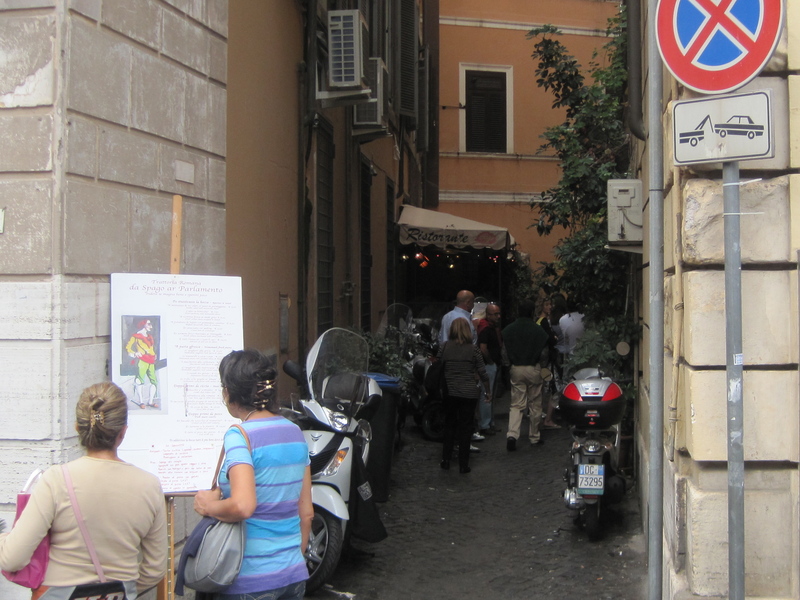 After asking two different poliziotti, policemen, and a woman organizing displays along with the owner of a small bookstore, we finally spied a curious sign and arrow, opening into what appeared to be nothing more than a back alley. Aha! 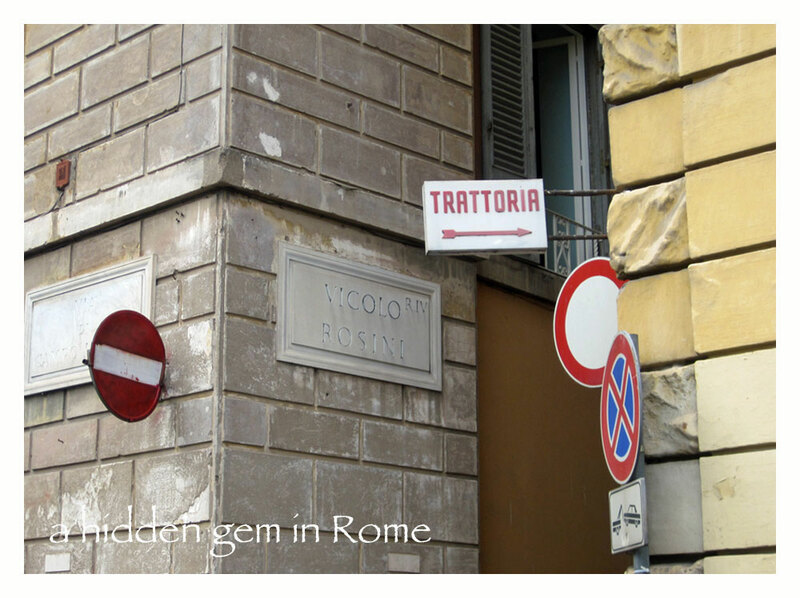 It was in fact the illusive Vicolo Rosini, so we ventured in. The clanking of dishes and accompanying clamor of dozens of conversations taking place all at once, led us to believe that this might just be the right location. 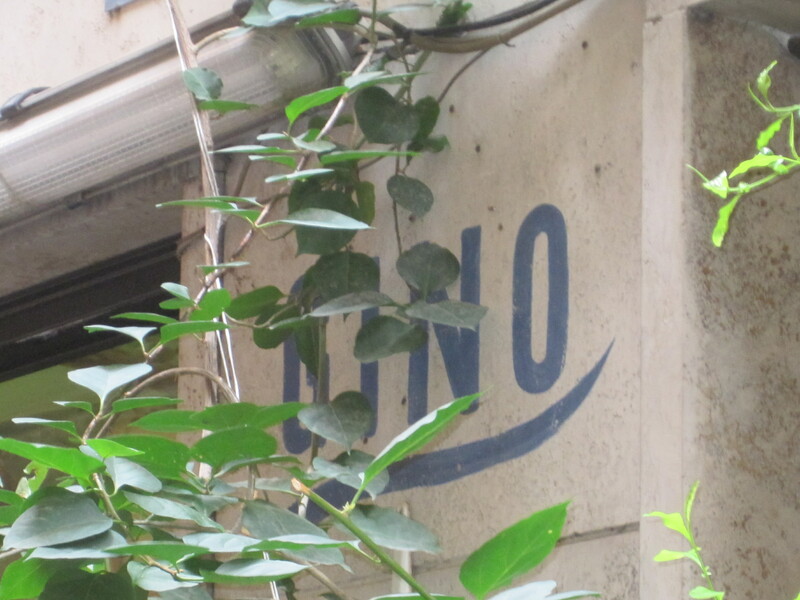 But even then, we weren’t exactly sure because all exterior signs for “Da Gino” had long since been covered by overgrown plants and ivy. Suddenly we spotted, in appropriate helvetica font, the little number 4 carved into the stone. We found it! A man with his arms full of dishes paused in his hustle by the front door long enough to ask what we wanted. Leaning closely into us with an inquisitive grimace, he strained to hear our name over the din. He then yelled it to an unseen man around the corner just inside. Confirming that they had been looking for us, he motioned enthusiastically with his head and eyebrows several times toward the open table for two in the center of the room. It was completely packed with people, except for our waiting table. That was our cue to go sit down. Inside, there was a vaulted ceiling, depicting an ivy covered pergola, hand-painted in a rather crude but charming style. The painting cleverly disguised the electrical conduit. The wall to our right was covered down to the wood wainscot with a rather gaudy Italian scene against a jarringly too-blue sky. The opposite wall had another hand-painted mural of a large stone tower which provided a nice visual respite from the blue. However, upon closer inspection, we could see that the tower “windows” were actually cutouts in a plywood panel, through which to read the meters and dials of climate controls, not too secretly hidden behind the door—which was cleverly hinged to look like the tower. There were other unusual decorative features and miscellaneous articles strewn about, but . . . you get the idea. The waiter was one of those people you feel like you have known your entire life. He was funny and personable amid his busy routine—at times spinning in the tight spaces between tables, carrying plates of food with his arms above his head, while leaning down to talk to someone. His moves were efficient and fluid, a well-orchestrated dance that he practiced daily. Since he considered everyone a friend, he granted himself “touch privilege” which he surely deemed necessary in such close spaces. Repeatedly, he placed his hand on Em’s shoulder to steady himself as he stretched to deliver a nearby neighbor’s plate. Em made a joke early on, qualifying him for a hearty slap on the back with an audible smacking sound, signaling our approval—we were in! There was another man helping out whose character and demeanor seemed to be the exact opposite of our waiter’s. He appeared to be in his mid-eighties and walked with a very slow shuffle—feet barely leaving the floor. His hands shook in a steady rhythm as he moved with plates of pasta across the room (surely cooled down by the time he delivered them). It didn’t take long for us to realize that this must be the one and only Gino. Our waiter clearly had to make up for the lost time when Gino ventured out from the kitchen, focused intently on his destination. But there seemed to be mutual respect and a strange artistic balance in their styles. Patrons of the restaurant all seemed to be enjoying their lunch together. People were laughing and talking between tables. It was the happiest group of diners we’ve ever experienced. They all seemed to know this place well and absolutely adored Gino. Our meal was finished, and we were looking forward to the ceremonial coffee, which is a must at any true Italian restaurant—or so we thought. Our new best friend, the waiter, denied our request for two coffees. He simply said, “Non c’è, there isn’t any.” At the same time, we each enthusiastically said, “Come no? Why not? !” “Eh . . . il cappo ha detto che caffé non servire qui! The boss says no coffee is served here!“ he explained. We were speechless. Minutes later, Gino sauntered by, brushing against our table. Em asked why the restaurant doesn’t serve coffee. His answer? “C’è un bar vicino e c’è buon caffe li! There is a bar nearby and there is great coffee there!” Apparently over the years, people repeatedly told Gino that his coffee was cattivo, really bad. So rather than try to perfect his coffee making, he finally decided to send diners to the bar for their post meal coffee. With Gino’s proclamation, the restaurant stopped serving coffee altogether. It was just that simple. He spoke with a half-smile and a twinkle in his eyes, suggesting he was proud of his decision to buck the system. Much more than a lunch, it was an experience about life. We were reminded once again about the importance of knowing what you love, and dedicating yourself to it; knowing who you are, but also who you are not. Gino is a restaurateur. He loves the joy of feeding people. He is not a barista. We better understood the importance of making tough decisions and standing behind them no matter what. But most of all, we realized that none of those things really matter unless you’re having a good time—fun is contagious, and people walked away from Gino‘s on Saturday with far more than they might have expected. We certainly did!